Serious consequences of the oil palm industry in Riau province, Sumatra. 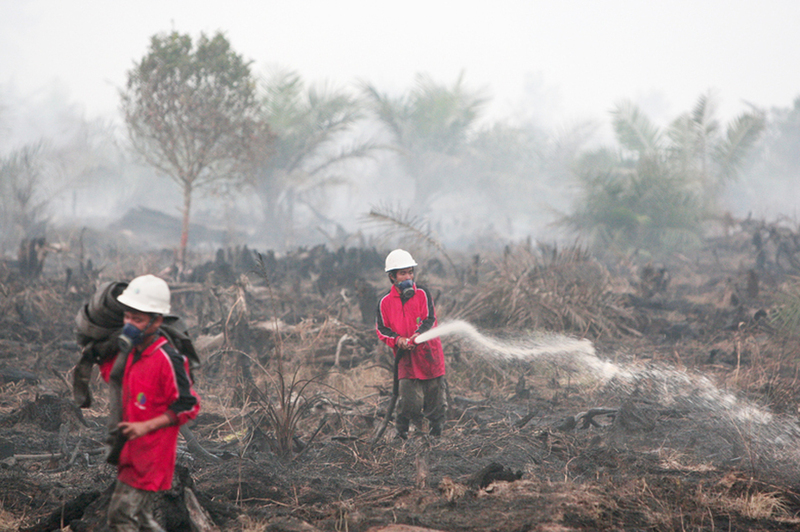 There is overlapping between the hotspot of fires, oil palm concessions and peatlands. The oil palm expansion in Indonesia was at the beginning at the expense of forest concessions or/and or expelling local population with customary land ownership. The implications and the mechanism of the oil palm expansion in Riau province is complex and diverse. This case focuses on the conflict related to the link between oil palm industry concessions and fires. Nowadays, the oil palm expansion in Riau continues opening forest areas and also drying peatland by the building of canals to make the land cultivable. In 2003, in a small village of Dosan (two hours of the Riau capital), the regional government began a poverty-alleviation project, giving three hectare plots to smallholders to plant oil palms. This project is also common in the majority Indonesian rural areas. On receipt of the land, the villagers drained the peat to make the land more productive by dissecting it with a labyrinth of canals. The fires have been used as a method of land clearing by both small-holders and large corporations . In early 2007 through satellite monitoring, Greenpeace identified fire hotspots in Riau Province also in 2015. Comparing and overlaying maps of peatlands and forest concessions signaled there was significant overlap between the location of fires, oil palm concessions and peatlands. More than half of the forest and peatland fires that occurred in Riau in 2013 were located within concession areas, i.e., land already licensed to large companies . Also the Environment Ministry found that burning had been done on land operated by 26 companies . The peat soils (9 million hectares in Riau province) have the highest concentration of carbon stored per hectare of anywhere in the world. The fires are so intense between August and October (dry season) due to the fact that dry peat is very combustible. The fires produce vast amounts of smog. Consequently, the authorities ordered closing hundreds of schools and several local airports. The air pollution caused respiratory illness in more than 500,000 people . Some citizens left the polluted region to avoid haze, especially pregnant women and babies . The most dangerous fires in Riau took place in 2015. The hectares burnt in 2015 in Riau province were 139,000 ha (5 per cent of hectares burnt in Indonesia) . 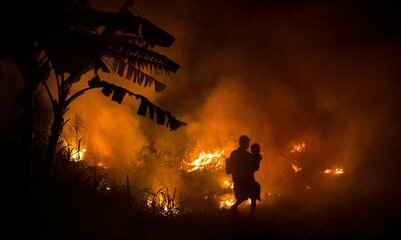 According to researchers from the Harvard John A. Paulson School of Engineering and Applied Sciences (SEAS): "Smoke from 2015 Indonesian fires may caused 100,000 premature deaths" . As a consequence all negative impacts, the Indonesian National Board for Disaster Management stated that Riau province together other five Indonesian provinces had declared a state of emergency due to the haze . After this event there have been increasing protest and actions against the fires. For example at international level, in 2016, Greenpeace launched a mapping tool allowing the public to monitor fires and deforestation in near-real time, and see to an unprecedented extent who controls the land where they are taking place (See ref : Interactive map in real time on fires, plantation concessions and ownerships). Protests were also widespread as thousands of university students, teachers and lecturers staged a rally at the governor's office demanding an end to the haze problems. They urged the government to arrest owners of big companies operating in Riau alleged to be involved in forest and land fires in the region. 18 oil palm companies were accused of having been involved in the fires. However, 10 of them were exonerated by the police before they went to court. Two other companies have seen their cases brought to court, six other companies are still being investigated . Locally, in Dosan village, a farmers’ collective known as Cooperative Bungo Tanjung launched a programme to protect peatland, prevent fires and promote better cultivation practices in 2009 . The programme promotes canal blocking. “We build the dams to keep the level of the water stable at a minimum of 30cm. At this level, palm oil can grow but it is humid enough to avoid fires,” explains Pak Dahlan, a senior farmer in the village. They have made a common agreement to stop the practice of slash-and-burn. Moreover, the Indonesian government and the United Nations Environment Programme (UNEP) funded a community-based firefighter unit (called Masyarakat Peduli Api) patrols several times a day in Dosan. However, according to sources in Indonesia, the most effective fire management interventions can be the peatland rewetting, however that is also the most controversial, Rachel Carmenta, a post-doctoral fellow at the Centre for International Forestry Research says, and deploying these “will therefore require significant negotiation and stakeholder dialogue to bring about consensus, in turn requiring expertise, money and time – as well as monitoring" . Project Details Riau contributes up to 24% of total palm oil national production in Indonesia. There is a significant overlap between the location of fires, oil palm concessions and peatlands. Oil palm plantations grab about 1.9 million ha of land (around 21% of the total area of Riau province) . There are 144 palm oil mills in the province. More than 50% of production comes from private states . There are 380,000 smallholder plantations producing around 5.9 million tons of fresh bunch fruit annually on around 1 million ha. The World Bank reported that there are three common uses for fire in Indonesia, most of them related to oil palm industry: (i) land clearing and preparation; (ii) land acquisition; and (iii) as a mechanism to force inhabitants off the land. The analysis from the Center for International Forestry Research (CIFOR) concluded that "using fire for land acquisition and clearing generates a cashflow of at least USD 3,077 per hectare of oil palm in just three years. If every hectare burned in 2015 were converted to oil palm, the value would be about USD 8 billion". The land clearing (production phase) is an illegal process, however the resulting palm oil is processed as legally-produced palm fruit. Riau has also seen conflicts on tree plantations, other than oil palm . Other Drying of land by drainage to plant oil palm, consequently increase the peatland burns. Development of Alternatives Dosan (a small village) smallholders have made a common agreement to stop the practice of slash-and-burn. They also propose wetting the peatland to avoid fires. Why? Explain briefly. One of the companies responsible for the fires has been sentenced by the court. But 26 other companies are operating in the hotspot area. Alternative measures and practices have emerged to prevent fires. However, the structural cause (concessions to oil palm companies) is not being addressed. The Guardian: Indonesia forest fires: has this Sumatran village got the solution? European Report: Oil palm expansion in Riau Province, Indonesia: serving people, planet, profit? WALHI releases Investigative Report on APRIL forest clearing. Interactive map in real time on fires, plantation concessions and ownerships.